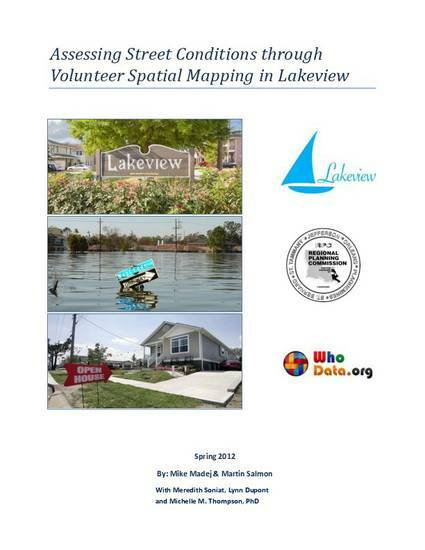 In September 2011 volunteers from the Lakeview Civic Improvement Association (LCIA) began taking inventory of street conditions in the Lakeview area of New Orleans, LA. The Lakeview area is a collection of neighborhoods located in Orleans Parish. After establishing a protocol that was developed in cooperation with the Regional Planning Commission, WhoData.org and LCIA, volunteers evaluated streets conditions block-by-block and collected primary data to be analyzed and incorporated within a geographic information system (GIS). The primary data included identifying nine street conditions: street type, rolling bumps, uneven plates, broken curb, missing pavement, water leak, raised manhole covers, potholes, and clogged/broken storm drains. The goal of this project was to improve community data collection techniques, enhance mapping and visualization of volunteer collected data, and provide a functional map for LCIA to convey street maintenance priorities to the City of New Orleans. This report summarizes the collection efforts and is provided as a case study model for local and national communities. By using a bottom up neighborhood planning model, improvements to public participation using GIS was achieved. Through a standardized means of data collection, and improved mapping techniques, community organizations can coordinate with governmental offices and other development organizations to target specific infrastructure changes that improve their neighborhood and contribute to the city’s revitalization efforts.